According to the renowned psychologist, Dan Ariely, fostering a sense of urgency by setting strict deadlines is a very effective way to overcome procrastination. When you give shoppers time to think, they’ll delay in making their purchase. If this delay happens long enough, they might not make a purchase at all! Don’t let this happen to you. The “ticking clock” of urgency is a constant reminder to your visitors, telling them to “Buy Now”. There are many ways to make your visitors feel there is a ticking clock urging them to make a purchase now. A special offer that is only available for a limited time. The expiration date of the offer creates a sense of urgency in your customers. Discounts and coupons for all types of products and services use this method. More subtly, you can hint that inventory is limited and supplies are running out, encouraging your customers buy a product before it runs out of stock. While not as powerful or in-your-face as the limited time offer, there is definitely a strong impact. Get creative! Brainstorm other methods to boost the sense of urgency. Tips here run the gamut from the clever use of delivery schedules to pitting customers against each other in a bidding war. Let’s look at some specific ways you can take advantage of the three approaches to increasing urgency in your customers. Others want this too. Act fast! Everyone loves to save money, and offering discounts is one of the most effective ways to encourage a sale. But if the discounts are offered indefinitely, you are training your customers to expect a permanent price cut. To avoid the effect of cheapening your product while still leveraging the power of a discount, set a deadline. Everything Furniture, an online furniture retailer, gives a discount but also emphasizes in bright pink text that the sale will end in a little over two days. For a customer to take advantage of the lower price, they have to buy soon. Sainsbury, a large British supermarket chain, uses the same principle. This coffee machine can be bought at a 33% discount, but the customer must act fast to get it. This tip is a variation of the first tip, except that the deadline is even more extreme – only twenty-four hours to take advantage of the special price! Holding daily deals, also known as “flash sales”, is becoming a popular way to urge customers to buy. KlearGear, an online retailer of “nerdy” products, takes advantage by offering an extreme time-limited 30% sale. Instead of having a deadline that’s linked to passage of time, consider linking this to available inventory instead. It feels more natural, and can be justified more easily than an artificial deadline. There’s no reason why you can’t provide deals after tomorrow, unless you run out of stock! ShopForWeddings, an online store for wedding supplies, offers “clearance prices” only while supplies last. This creates a sense of urgency in the mind of the customer to act quickly and buy before stock runs out. Give customers a personalized experience by varying the discounts and offers based on what they do. Implementing dynamic offers can be more effective than static offers in facilitating conversions, since it gradually escalates the sense of urgency and impresses the customer at the same time. Seattle Coffee Gear takes this to the max, with a one-time special offer that pops up while the customer is browsing. Once the customer starts adding products to the cart, another offer pops up, enticing them to reach $75. This ramps up again when $75 is reached, this time tempting the customer to spend even more to save an additional $45. Make sure customers are aware that sales are time-limited. Feature the discounted product and its deadline on your home page to stimulate customer interest and urgency. Eddie Bauer, an online clothing chain, uses this tactic to sell its trench coat. Shipping costs are determined only during checkout, and they can sometimes be substantial. If your customers know that free shipping will be available for a limited time only, customers will be tempted to buy in order to save money on shipping. The Lakeside Collection, a discount retailer, uses limited time free shipping to encourage site visitors to spend at least $100 on their site. Customers do not truly realize the full cost of everything on their shopping list until they see the list of items in their shopping cart. This can sometimes cause sticker shock, and discourage customers from buying. Altrec, an outdoor apparel retailer, fights this impulse by reminding their customers on the cart page that some special prices are available only for a limited time. Offering special deals and discounts is pointless if visitors are not aware of them. If real estate on your home page is limited, consider using a popup to let shoppers know about your promotion. However, use this sparingly as popups prevent customers from doing anything else, so it’s got to be a worthwhile offer, worthy of taking people’s attention. In this example, Party Supplies Delivered informs its first time shoppers of a 10% sale available for one day only. Coffee for Less adds a unique twist to address shopping cart abandonment. If visitors add a product to their shopping cart and attempt to leave without buying, a popup code offers a coupon available only for a very limited time. In addition to featuring your offers prominently on your website, you can inform customers of limited time promotions via e-mail. SmartHome, a home automation specialist, reminds newsletter subscribers and customers about its 20% lucky sale. One way to ensure all visitors are aware of your special offer is to make it visible throughout the site. Advanced Auto Parts, which sells car parts and accessories, has a floating bar that remains on top of the page no matter where the visitor goes. Like a “while supplies last” offer, admitting that you are out of stock is a subtle yet clever way to give a sense of urgency. If shoppers can see that some products are sold out, they will be motivated to buy the other remaining products before they are sold out too. Rue La La, a members-only lifestyle retailer, cleverly employs this tactic to convey a “hurry-up-before-it’s-too-late” mentality. Consider warning customers of limited availability on the product page. This creates a deadline in their minds, as well as a sense of competition, “I must buy this before someone else does”! This can spell the difference between a visitor leaving your site and making a purchase. Cosmetics retailer Beauty Encounter not-so-subtly encourages shoppers to buy before it’s too late, with just a short message. Ozbo, a home supplies retailer, provides more detailed information – Hurry! – only four left in stock. This is an even more drastic version of informing customers about limited availability. This is a very effective way of selling out the very last stock, as shoppers will really be tempted to fight for it. Modnique, an online fashion boutique, warns shoppers that the item is the last one left. There’s no need for the message to be displayed prominently – the message alone is enough to immediately create a sense of urgency. Limited availability can also be shown on your product category pages. This works especially for catalog style sites where the category pages are designed to be browsed constantly. Online computer retailer PC World uses this tactic to good effect. Its category pages facilitate quick comparison between products, and the “Hurry! Last few” prompt often provides shoppers with that last nudge to buy. The shopping cart view is a crucial part of the buying experience. If the customer balks at the price or decides to wait, then you’ve lost an immediate sale. Franklin Planner stacks the odds in its favor by indicating “Limited quantity” to hurry up the sale. Sparkfun Electronics takes a similar approach, except they indicate the exact quantities remaining. This is a more subtle way to promote urgency. Swim Outlet, a specialty swimwear store, eschews subtlety in favor of a bold declaration of “ONLY 1 LEFT!”. It drives home the sense of “hurry up!” by telling the shopper outright that the item may become unavailable if purchased by other shopper. Instead of a one-size-fits-all message, consider customizing the warning message based on how much stock is remaining. The messages can run the gamut from subtle to outrageous, as inventory levels dwindle. Boticca – which sells women’s fashion accessories changes its low stock availability warning from relatively sedate to an attention-seeking “Act now” message. 17. Others want this too. Act fast! If you don’t want to be too obvious, there are other methods to imply that stocks are limited, without actually saying so. One way is to mention that the item the shopper is currently looking at is already in the shopping cart of another customer. This kind of subtlety works if your customer knows there are only limited quantities because of the nature of the product. Ruby Lane is a marketplace for antiques and collectibles. Because this type of product is limited in quantity, there’s really no need to say stocks are limited. A message that the item is already in someone else’s cart can foster that sense of urgency. Hotel rooms are another product that comes in limited quantity. Hotel.com’s popup reminders implicitly scream “ACT FAST!” to whoever is browsing. These tips don’t need to be implemented in isolation. Mix it up by combining various tactics to boost the sense of urgency even more! Rue La La combines a deadline based on availability, and a low-stock warning. Costco, a member-only warehouse club, combines two techniques: a time-limited and supply-limited offer. There is nothing more urgent than having a ticking clock count down the minutes and seconds to the deadline. Having a countdown timer can really ratchet up the tension and encourage shoppers to take the plunge. Hautelook, which offers private limited time sales, has a countdown timer for each item in their shopping cart. Coffee for Less takes a similar, but more in-your-face tactic. After adding a product to the shopping cart, it is reserved for a limited time. The remaining time is shown on a large countdown timer that appears at the top of every page. Some orders are time-sensitive and need to arrive by a specific date. This is especially true for Christmas, but can also work for holidays such as Valentine’s Day and Mother’s Day. If shoppers want the product to arrive by a specific date, increase the chance that they will buy by reminding them of the delivery deadline. Blue Nile, which sells fine jewelry, sets a hard deadline for products to arrive in time for Christmas. Hotel Chocolat, a British chocolatier, uses Halloween to encourage candy sales. No holiday? No problem! People are impatient and want instant gratification. Use this to your advantage by reminding shoppers that they will be enjoying the product tomorrow if they order today. Shoebuy encourages impulse buying by promising same-day shipping for orders made before noon. Hiking Equipment takes the same strategy, but uses a more visible countdown timer. Anticipation is a very close cousin of urgency. If you tease customers about what products will soon be available, you can create a sense of anticipation which quickly translates to an urge to act immediately once the product becomes available. Rue La La informs shoppers about upcoming products and deals. It also makes the extra effort of giving shoppers the chance to subscribe to reminders via e-mail or texting. People are naturally competitive, and will strive to win. Selling products through an auction directly pits one customer against each other. Creating a sense of urgency is all about using human psychology to your benefit: during the heat of competition, everything else becomes secondary to beating the other person. Competition magnifies the sense of urgency. Bidlast runs a “reverse auction” where the winner is the person who bids last. The auction clock ticks down with the submission of every bid, with the last bidder able to buy it at the specific price. This strategy maximizes sense of urgency for the customer to get in the last bid. So, what are you waiting for? Use these tips to increase the sense of urgency! Hurry, before it’s too late! 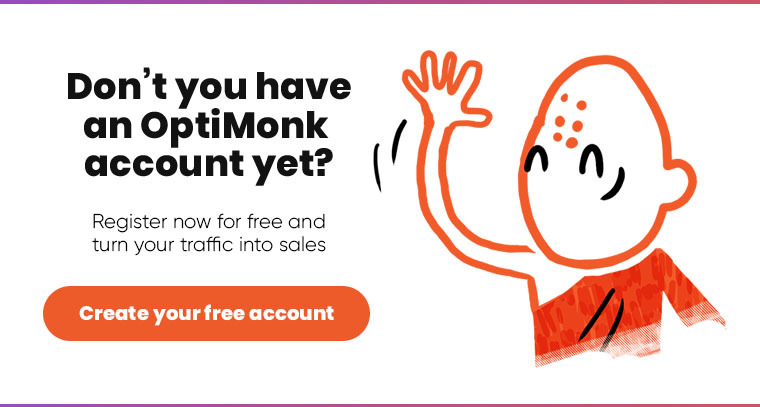 Just click here and create a free OptiMonk account. Wonderful article, thank you. You collected so many useful tricks here. The challenge is to act on this useful information and actually apply it at your store. Some of these techniques require installation of custom modules and plugins. And of course, you should A/B test what works for you the best. But urgency always works, this is for sure.